Even if you don’t live in Missouri, you have probably heard about Missouri’s law to limit teacher and student interaction on social networks like facebook (see STL Today Article). I’ll let the judges in Missouri work out whether the FB law there is constitutional or not, but I do want to discuss some common sense tactics for dealing with students in the age of social networks. These tools can be great for communication, tutoring and sharing information, but they can also be troublesome when they open up too many doors into a person’s private life. There are many social networks out there, but Facebook is by far the most popular, with Google +1 in its early stages of testing. 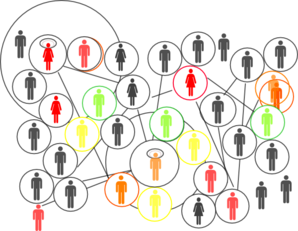 Ten years ago, email was the go-to place for creating a social network, where you would have a group of people sharing information and resources by email. This method still exists (see google groups), but it is limited in how much real-time discussion can occur. Almost anything that allows you to comment, post, and have a digital presence can qualify as a network and includes places like youtube, news sites, and photo sharing sites like flikr. I’m going to mainly limit this discussion to the direct social network sites like facebook. First, it is important to understand that no matter what your privacy settings are, nothing you ever post is truly private. Windows 7 has this great snipping tool where anyone can snip a bit of text or images off their screen, save it to their hard drive and then pass it around. Treat any post or photo as if it could be posted at your job or your family reunion. That being said, you don’t have to be paranoid, for the most part, private messages will remain private among trusted friends and the tools that social networks have for maintaining your privacy have really improved over the years. Google +1 ‘s system is likely going to make it easier to have conversations remain in specialized circles, but my experience has also shown it’s very easy to accidentally post something to the wrong circle. Friending students is largely a personal preference, I have seen colleagues with tons of friends that are students, some of them have their own children in the district and friend them and their kid’s friends. I’m not sure there’s any harm in this, and most feel its a good way to keep an eye on their own children to make sure they are not posting inappropriate content (adolescents don’t always have the best judgment). I do think that adults probably should limit their interaction on their kids (and friends of kids) pages because it always tends to look creepy when your mom comments on a post you made about Justin Beiber or other random thought. Parents and teachers should probably remain in the background in the same way that they do when their kids have friends over, offer them a soda, a sandwich, provide a safe place and then let them be kids. I personally do not friend my students because I prefer to keep a professional distance ; sometimes students being too personal can lead to problems in the classroom with discipline. There is an alternative to friending your students which gives them access to your personal feed, and that alternative is to create a page for your classroom. I created a facebook page for biologycorner and I have had students post to that page on occasion. It does not require friending and everything you post is considered “public”. You can make any number of these fan pages which would allow you to post information about your class, school events, and link to relevant topics. This type of page is very useful for clubs and groups within a school and allows for more generalized interaction, our school’s band and science club keep a facebook fan page to keep people updated on events and news. The other advantage of the fan page is that you do not need to manage who is friends and who is not, or who is in the group and who is not. The page might be for the band, but many kids not in the band are regular visitors. The downside of the fan page is that you cannot easily use the page for specific classroom projects, nor can you easily control who visits and posts on the page. For instance, if you want your class to regularly read articles about current events and discuss them, the fan page may not be ideal because it has extra traffic and students won’t be as willing to share personal thoughts. There are social networks designed for educators and schools, and these systems are closed to the general public. The one I’m using this year is edmodo and it’s working great for sharing information, assignments, and discussing topics. The system is closed in the sense that only my class is invited to join the discussion. I create a group, and it generates a code that I give to my students, then they sign in and see only posts from those in the class. The site itself looks a like like facebook (even in its color scheme) so my students are already familiar with how it works. Two years ago, I tried to make a forum for discussions and it did not go well because my students were unfamiliar with how forums work which made them reluctant to respond to threads and create their own topics. Students jumped right in with edmodo topics because most already had some experience with the format. My first assignment was for them to sign up with edmodo and post a short introduction where they said hello and told the class something about themselves. I was surprised by how quickly this assignment was completed, which usually indicates the level of enthusiasm of the students to do the assignment. Students could also fill out their profile information with their career goals and learning styles, and I’ve learned a lot more about my students from reading those profiles than I would have in classroom interaction. 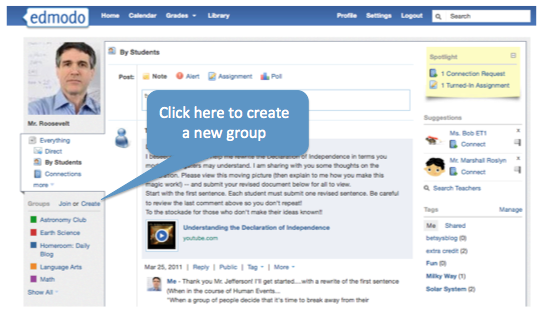 Like facebook, Edmodo allows you to make multiple connections with other professionals and groups. I have my classroom group, and then broader public groups that share science resources, ideas, and even files (edmodo has a “library” system). Edmodo is good alternative to facebook if you want something that is more controlled and relevant to education or specific to your class. There are other features within edmodo that could be useful that I haven’t yet explored, like the ability to post and submit assignments.